Based on Johnny Lee's original idea of finger tracking with a Wii Remote, we created a finger tracking system that uses the Wii Remote and gloves fitted with retro-reflective markers. 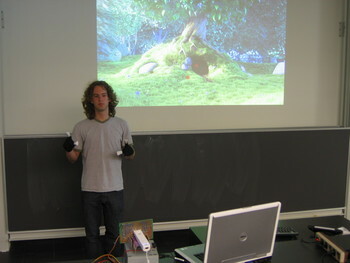 The hardware setup consists of the Wii Remote, an array of infrared LEDs, and a bluetooth dongle, in addition to a laptop and projector presentation setup. 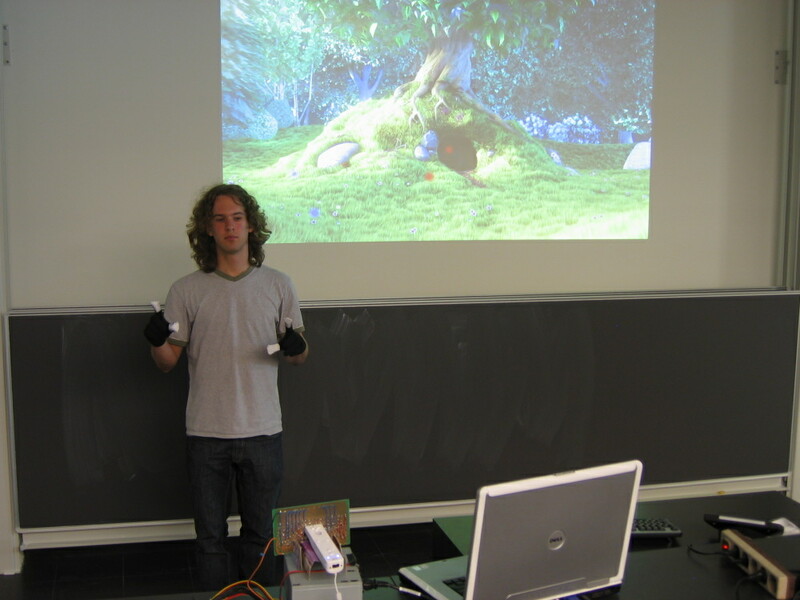 The project aimed at enabling free-handed multi-touch interaction, where problems arise such as having to identify the fingers of each hand and to recognize pinching for interaction. The final system allows dual-»touch« interaction with videos, images, and slide decks, and is designed to be used for presentations. Download the video as AVI-MPEG4 (15.9MB) or watch it on YouTube. Download a demo of the Two-Handed Interaction in Open Space (Win32, 28.3 MB) using the presentation we showed at Tabletop 2008 and try it out yourself. The source code of a rewritten C# version based on WPF (Win32, 126 kB) that contains only the recognition, pairing, and pinching part can also be downloaded. To be functional, however, both demos require some hardware (Wiimote, Bluetooth dongle, LED array, gloves with retro-reflective markers). This work was done at the University of Groningen, the Netherlands.